Blog #60: It is the Dawning of the Age of Empulse. And here is a nice 60’s poster to celebrate both the Brammo Empulse release and my 60th Blog post. One is much more important than the other. So TONS of Brammo News…And I am totally not involved in any of it. Happy for Brammo…sad for me…but, like Gloria Gaynor sang, I Will Survive. 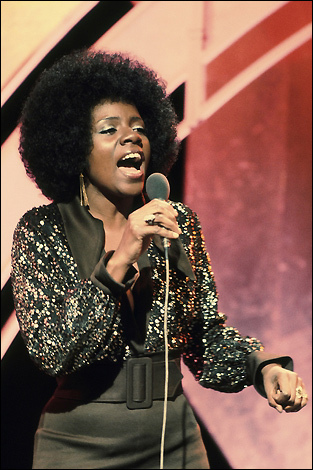 I am glad she’s still surviving, but I miss her funky fro…that was some sweet hair. But neither this blog, nor this post, is about Ms. Gaynor. It is about Brammo and some BIG NEWS. The First Brammo Empulse R has been delivered into a customer’s hands! That is a big day for Brammo…and a Happy Day for one lucky guy (though many more people will be getting their happy days soon). The first delivery was at Scuderia West in San Francisco. The first proud owner. Ain…a nice guy who we all hate now 🙂 Kidding. He has really stepped up and given a lot of information to the Brammoforum.com. If you are not a member…GO JOIN THAT SITE IMMEDIATELY. Here we see Adam from Brammo explaining to Ain how to throw a split fingered fastball. Ah, like the “Groom trying to leave and the Best Man holding the bottom of his Jacket”, here we have the obligatory ” The Handing over of the Keys” handshake photo. So that one red Empulse has been delivered. What’s next? More bikes getting crated up for delivery!! And what’s in the white box? I will assume the mirrors, the manual and warranty info (24 months now vs 12!) and the Brammo messenger bag Ain got with his Empulse. This is the first, or one of the first, Enertia Plus motorcycles getting into a customers hands. In Europe. Meaning that in the same week Brammo had delivered the first Empulse R to a customer in the United States and the first Enertia Plus to a customer in Europe. Now I’m just hoping for the floodgates to open and for there to be Billions of Brammos around the world…but that will take a while longer. From Brammo’s Facebook Page…If you haven’t already, run over and “Like” them. So, in conclusion….Bikes SHIPPING. It took a while, but that dreaded V word* can be put to rest. And the rest of us can look forward to some fun, fast and clean riding. Bonus photos…or curse photos…not sure which. Me as Grumpy Cat as I sat waiting for Brammo to get bikes shipping. Me as Honey Badger when I got the good news that bikes are getting into customer’s hands. not sure which of the two is more horrible and scary. Photos of the bikes, Ain and the Brammo personnel: gently borrowed from Brammo’s Facebook page and the BrammoForum. Horrible Photoshop images are borrowed from nobody…who would claim them??? eh, I don’t “overly” blame the V word shouters…It did take Brammo quite some time to get up and running and delivering to customers. And it is a hard field with companies coming and going…usually going. AND the people saying it have businesses that need to make money and see Brammo, right or wrong, as a threat. In the long run it will all be good. We need more than one, or two, companies selling electric motorcycles if any of them are going to succeed.